Seven years ago, Rem Jackson saw a need in the lives of many business owners and made it his mission to provide a solution. After realizing that most doctors, lawyers, and professionals were struggling with outmoded and ineffective marketing strategies, he co-founded Top Practices with Diane Jackson in 2007. From his experience, he had learned enough to know that there was a better way and because of a close relationship with AAPPM Top Practices has focused on helping podiatrists. Looking back at where he began, and where Top Practices is now, in 2013, it’s very gratifying for him to see the significant and dramatic growth that hundreds of practices around the country have experienced because they’ve implemented and utilized the Top Practices methods. What Will I Learn from Rem at the Summit? At the beginning of the Summit, on Friday evening, Rem will lay out exactly how Top Practices members are achieving dramatic, double-digit growth in their practices while also getting home earlier in the day, getting their weekends back, and having less stress. 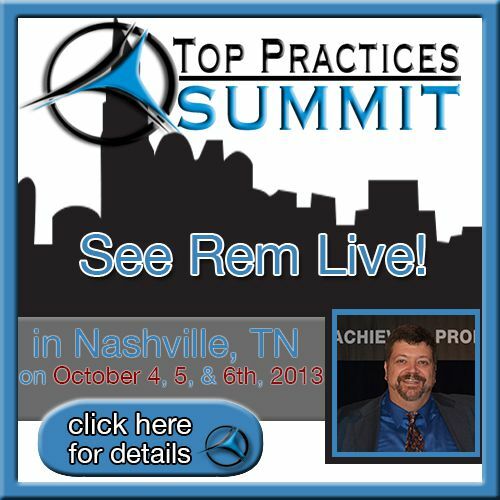 Rem is particularly excited about dozens of Top Practices members who will be sharing the specific ideas and strategies that they’re utilizing to make all of that happen. The Summit will be full of specific strategies and tactics that professionals can use to get the gain that they are looking for. It’s a conference that is focused on the latest, most current things that you need to do to market your practice, both online and in your community. Rem has the great fortune of being at the epicenter of a laboratory of the best practices in the country. The last 12 months alone have produced an immense number of great ideas that have had great traction and have helped his members accomplish their goals. One particular area of interest for many practices will be the session on new associates and how to make sure that they’ll hit the ground not only running, but sprinting. This session will give you the tools you need to successfully integrate your new associate and help them market and build their part of the practice. All of the aspects of the Top Practices Summit are equally exciting, but for Rem, he is most anticipating the Marketer of the Year awards. Dr. Melissa Lockwood, from Bloomington, IL, and Dr. Nicole Freels from Lexington, KY, will be competing. These young doctors began their journey with Top Practices one and two years ago, respectively, and have made leaps and bounds forward in their marketing efforts. The Marketer of the Year awards is always very informative, inspirational, compelling, and extremely helpful to all who attend. Rem is absolutely thrilled about visiting Nashville, TN for this year’s Summit. He chose Nashville because it is not only a place that is easy to get to, but it is a place that is on many people's "bucket lists." Nashville is “Music City”, after all! This fun location is home to the Summit venue: the Gaylord Opryland Hotel. It’s simply an astounding facility, filled with restaurants and bars. It’s also so massive that Rem advises attendees not to lose their maps when they check in, or they run the risk of getting lost! The Top Practices Marketing and Management Summit is the one event that you don’t want to miss, and it happens only once a year! Don’t miss your chance to register for this exciting conference.